from 40 pcs. 0,60 EUR ea. from 80 pcs. 0,55 EUR ea. from 160 pcs. 0,51 EUR ea. The convenient solution if you want to glue on a disc magnet. This very flat disc magnet (18 mm diameter, 2 mm thick) features a very strong self-adhesive foam side. With this disc magnet, every surface can turn into a bulletin board in no time and you can hang up photos anywhere without drilling holes. Self-adhesive products need to be placed, pressed and dried on suitable surfaces to adhere properly. Please read our FAQ about self-adhesive magnets. 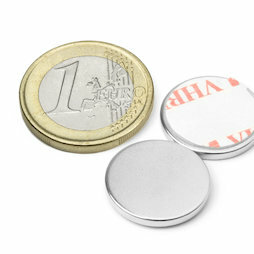 With 4 of these magnets you can, for instance, securely attach a light picture frame to a metal surface.